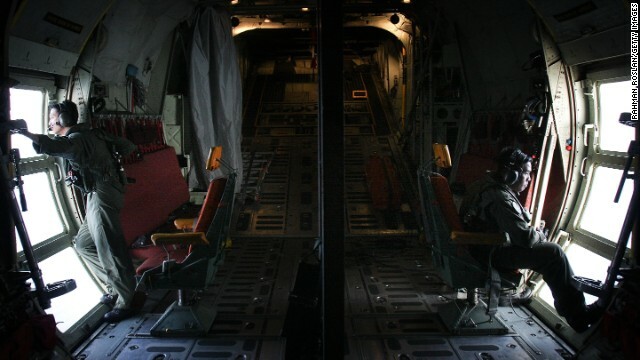 (CNN) -- Family members of passengers aboard Malaysia Airlines Flight 370 faced an agonizing wait for answers, as the aircraft remained unaccounted for more than a day after it was scheduled to land. In China, home of most of the 239 people on board, relatives of the passengers gathered in a conference room at a hotel complex in the Lido district of Beijing. They grew increasingly frustrated Sunday as the wait continued. More than 100 people signed a hand-written petition that demanded "truth" from the airline by Sunday evening. They also urged the Chinese government to help them deal with Malaysian authorities. More family members arrived Sunday. Video from Reuters showed Malaysia Airlines personnel in Beijing, where Flight 370 was headed, helping family members apply for expedited passports so they could fly to Kuala Lumpur early this week. 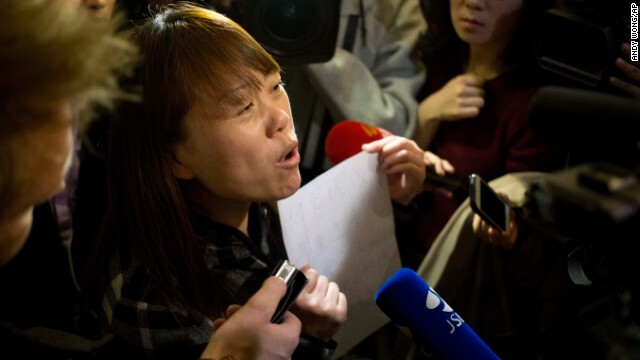 Zhang Guizhi, aunt of passenger Li Yan, told CNN that she had arrived from her native Henan province in central China and remained uncertain about how the airline would help her obtain a passport to travel to wherever the plane is found. She started crying when she mentioned that her 31-year-old niece had traveled to Malaysia with her husband and four friends for vacation. A man who identified himself as the brother-in-law of passenger Ding Lijun said he had just arrived from Tianjin. He teared up when he said Ding had been working in Malaysia as a construction worker for a year and was taking his first trip home. 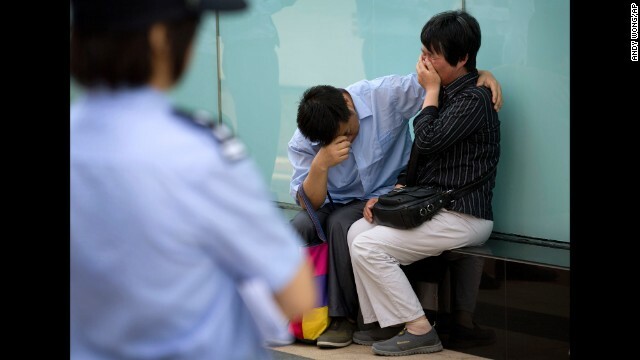 A policewoman watches a couple whose son was on board the missing Malaysia Airlines Flight 370 cry outside the airline's office building in Beijing after officials refused to meet with them on Wednesday, June 11. The jet has been missing since March 8. 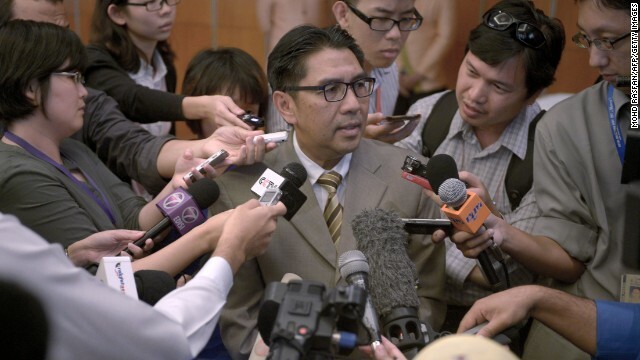 Members of the media scramble to speak with Azharuddin Abdul Rahman, director general of Malaysia's Civil Aviation Department, at a hotel in Kuala Lumpur, Malaysia, on Tuesday, May 27. Data from communications between satellites and missing Malaysia Airlines Flight 370 was released Tuesday, more than two months after relatives of passengers say they requested that it be made public. 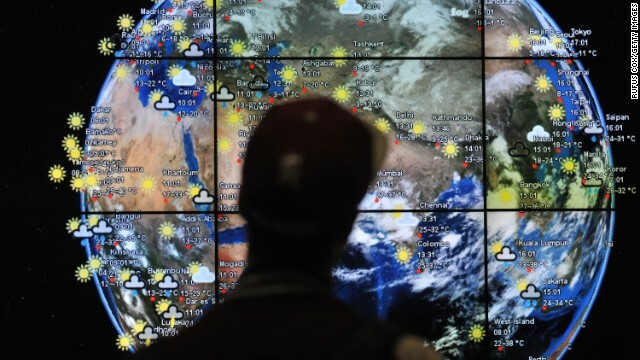 This photo illustration shows a journalist looking on the data communication logs from British satellite operator Inmarsat. Malaysian authorities have published the 47-page document containing hundreds of lines of communication logs between the jetliner and Inmarsat's satellite system. Relatives of Chinese passengers who were on Malaysia Airlines Flight 370 listen to part of the audio communications between Flight 370's cockpit and air traffic controllers during a meeting with Malaysian officials Wednesday, April 30, in Beijing. 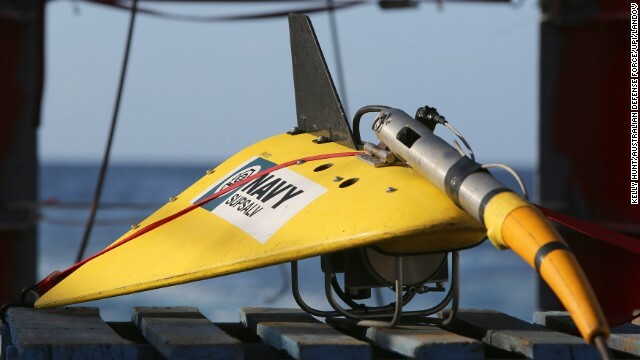 An autonomous underwater vehicle is brought back aboard the Australian ship Ocean Shield after a search mission for the flight Saturday, April 19, in the southern Indian Ocean. A Royal Malaysian Air Force plane takes off from an airbase near Perth, Australia, to help in the search on Thursday, April 17. 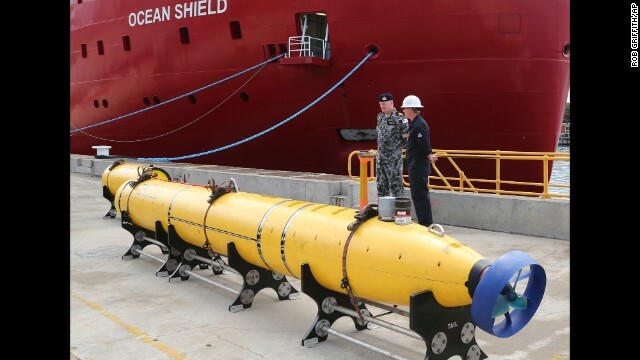 Operators aboard the Australian ship Ocean Shield move Bluefin-21, the U.S. Navy's autonomous underwater vehicle, into position to search for the jet on Monday, April 14. 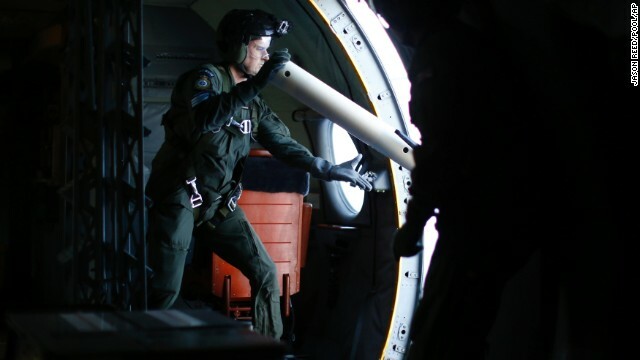 A member of the Royal New Zealand Air Force looks out of a window while searching for debris off the coast of western Australia on Sunday, April 13. 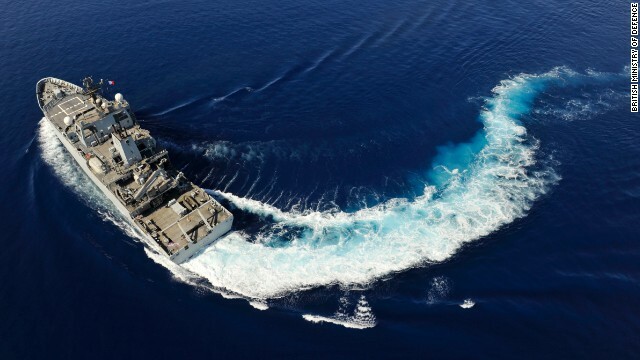 British Royal Navy sailors aboard the vessel HMS Echo take part in the search for the jet on April 13. Crew members aboard the Echo watch a smaller boat that's part of the British search effort on April 13. The Echo moves through the waters of the southern Indian Ocean. 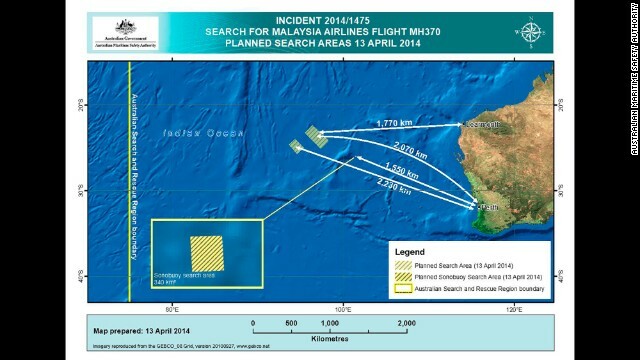 A map provided Saturday, April 12, details efforts to find the missing jet. 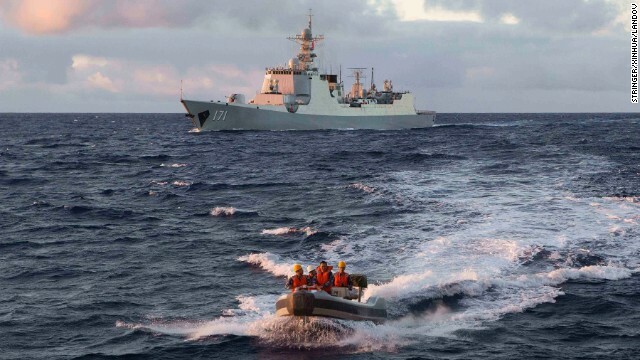 Chinese navy personnel head out on a boat to the Royal Australian Navy ship HMAS Success on Wednesday, April 9. A Royal Australian Air Force AP-3C Orion, on a mission to drop sonar buoys to assist in the search, flies past the Australian vessel Ocean Shield on April 9. 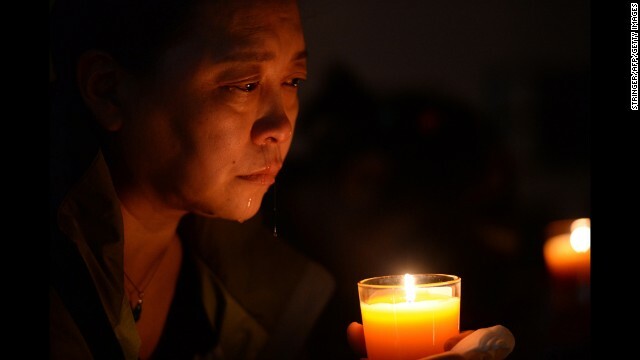 A relative of a missing passenger cries at a vigil in Beijing on Tuesday, April 8. A member of the Royal Australian Air Force walks toward a plane that just arrived in Perth on April 8. 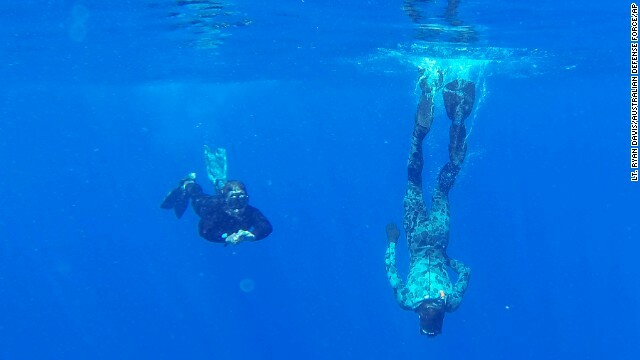 Australian Defense Force divers scan the water for debris Monday, April 7, in the southern Indian Ocean. 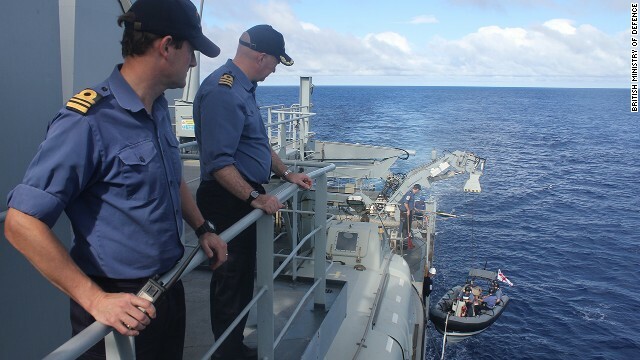 A towed pinger locator is readied to be deployed April 7 off the deck of the Australian vessel Ocean Shield. Capt. 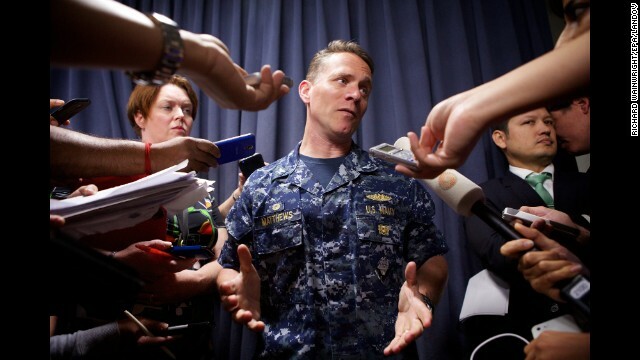 Mark Matthews of the U.S. Navy talks to reporters in Perth about the search on April 7. 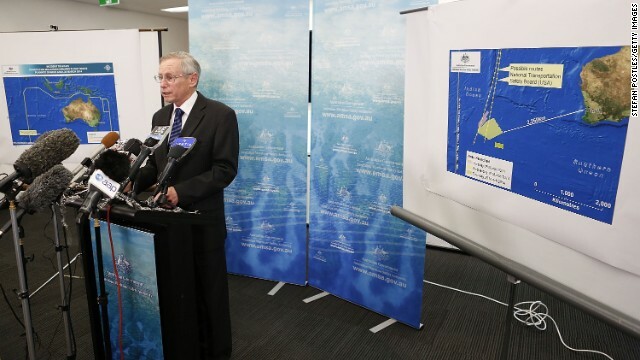 A member of the search operation points to a map outlining search areas during a news conference April 7 in Perth. 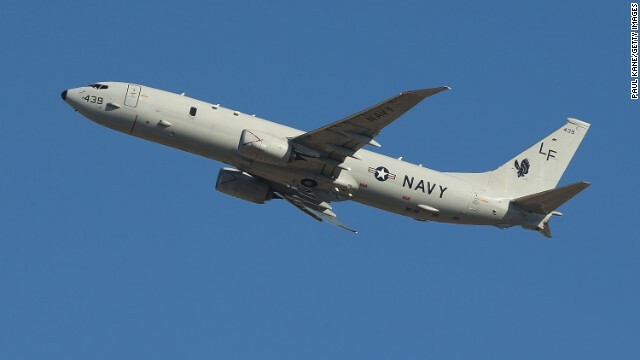 A U.S. Navy airplane takes off from Perth to assist in the search on April 7. A member of the Royal New Zealand Air Force looks at a flare in the Indian Ocean during search operations on Friday, April 4. 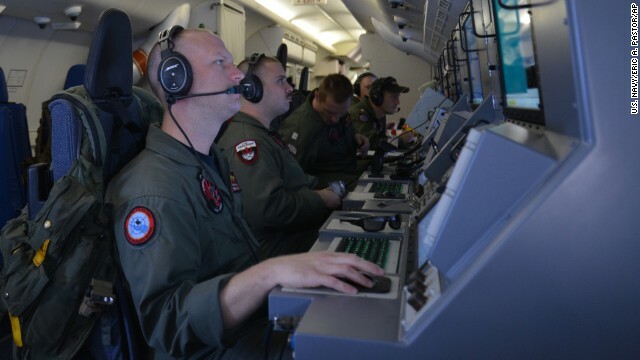 Members of the Royal New Zealand Air Force monitor data April 4 on board an aircraft during search operations. 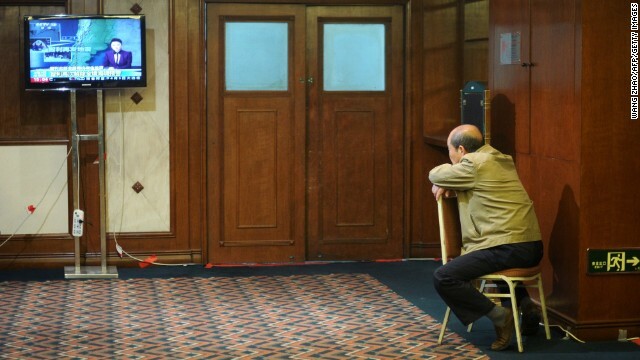 A relative of a Flight 370 passenger watches television in a Beijing hotel as he awaits new information about the missing plane on Thursday, April 3. Another relative of a Flight 370 passenger waits for updates in Beijing on Wednesday, April 2. 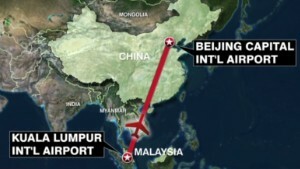 Many families have criticized the Malaysian government's handling of information in the plane's disappearance. 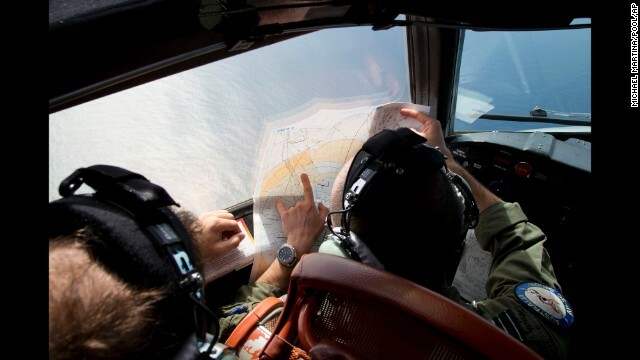 A member of the Japanese coast guard points to a flight position data screen while searching for debris from the missing jet on Tuesday, April 1. 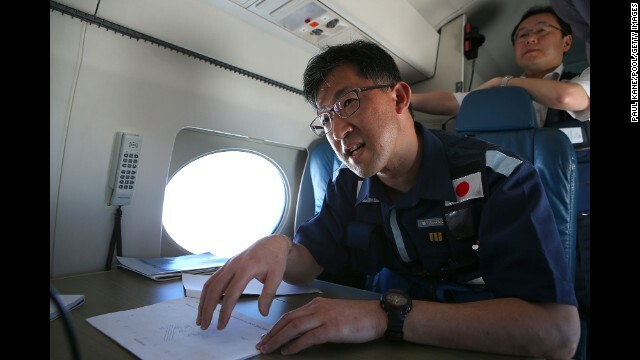 Kojiro Tanaka, head of the Japanese coast guard search mission, explains the efforts en route to the search zone April 1. 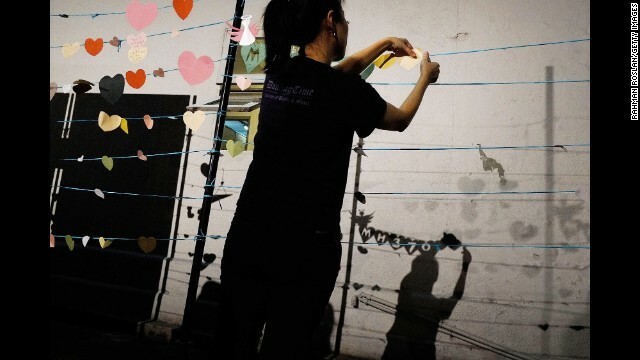 A woman prepares for an event in honor of those aboard Flight 370 on Sunday, March 30, in Kuala Lumpur, Malaysia. An underwater search-surveying vehicle sits on the wharf in Perth, ready to be fitted to a ship to aid in the search for the jet. 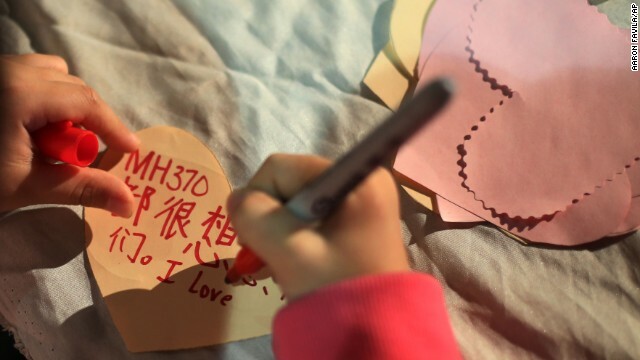 A girl in Kuala Lumpur writes a note during a ceremony for the missing passengers on March 30. A teary-eyed woman listens from the back as other relatives of Flight 370 passengers speak to reporters March 30 in Subang Jaya, Malaysia. 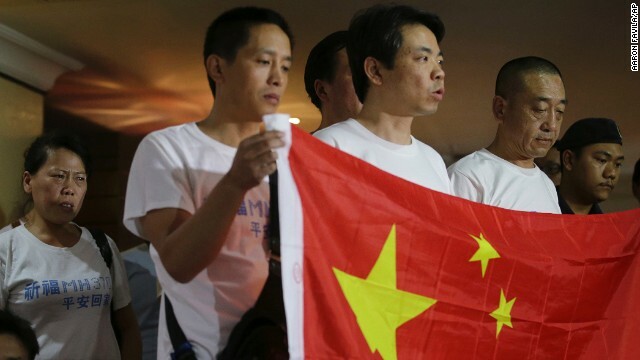 Dozens of anguished Chinese relatives demanded that Malaysia provide answers to the fate of those on board. 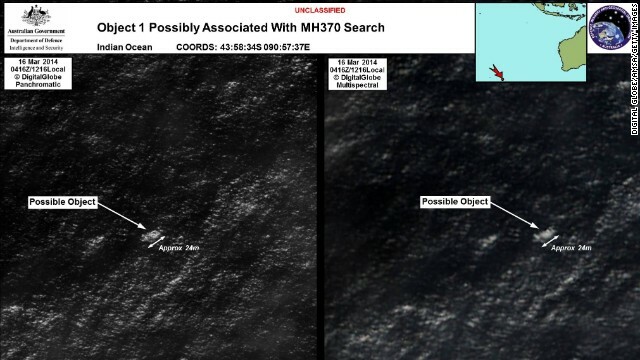 An object floating in the southern Indian Ocean is seen from a Royal New Zealand Air Force P-3K2 Orion aircraft searching for the missing jet on Saturday, March 29. 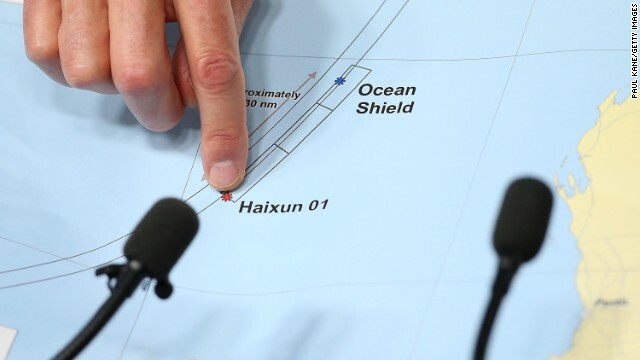 Ships participating in the search retrieved new debris Saturday, but no objects linked to the missing plane, according to Australian authorities. A Royal New Zealand Air Force member launches a GPS marker buoy over the southern Indian Ocean on March 29. 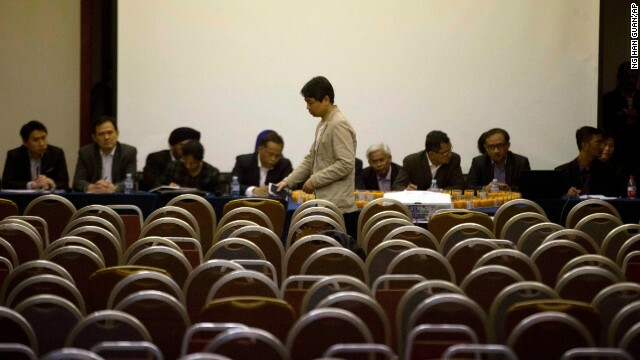 The sole representative for the families of Flight 370 passengers leaves a conference at a Beijing hotel on Friday, March 28, after other relatives left en masse to protest the Malaysian government's response to their questions. 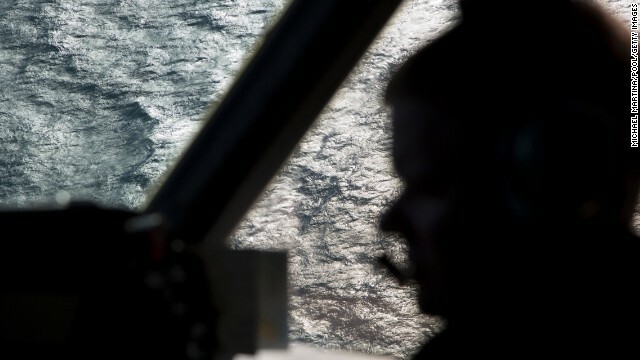 A member of the Royal Australian Air Force is silhouetted against the southern Indian Ocean during the search for the missing jet on Thursday, March 27. 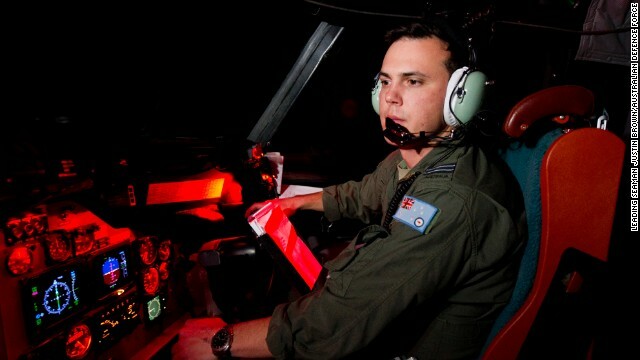 Flight Lt. Jayson Nichols looks at a map aboard a Royal Australian Air Force aircraft during a search on March 27. 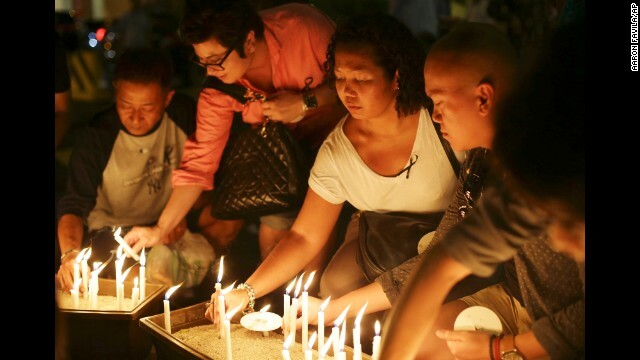 People in Kuala Lumpur light candles during a ceremony held for the missing flight's passengers on March 27. 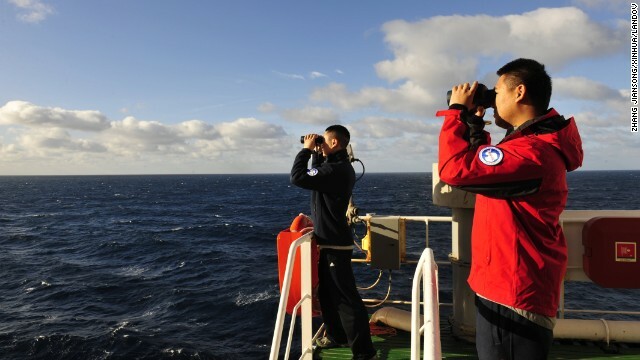 Crew members of the Chinese icebreaking ship Xuelong scan the Indian Ocean during a search for the missing jet on Wednesday, March 26. People work at a console at the British satellite company Inmarsat on Tuesday, March 25, in London. The mother of a passenger who was on Malaysia Airlines Flight 370 cries at her home in Medan, Indonesia, on March 25. 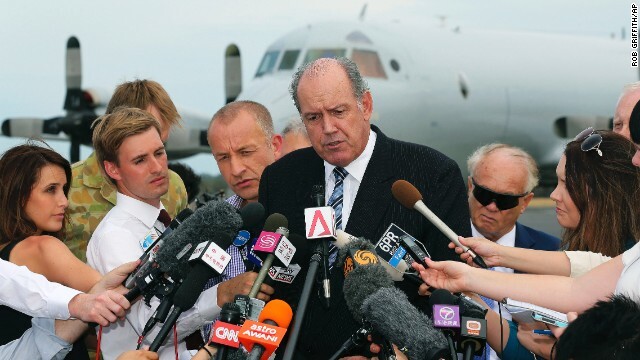 Australian Defense Minister David Johnston speaks to the media March 25 about the search for the missing jet. 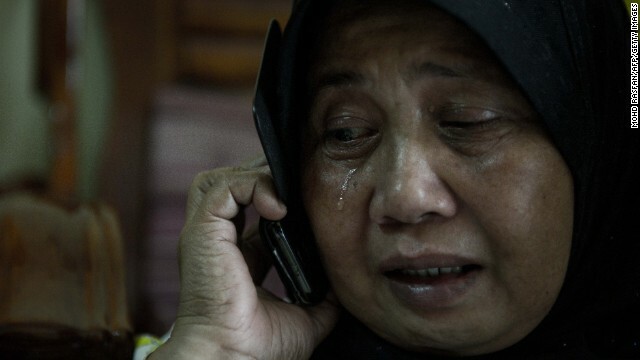 A family member of a missing passenger reacts after hearing the latest news March 25 in Kuala Lumpur. 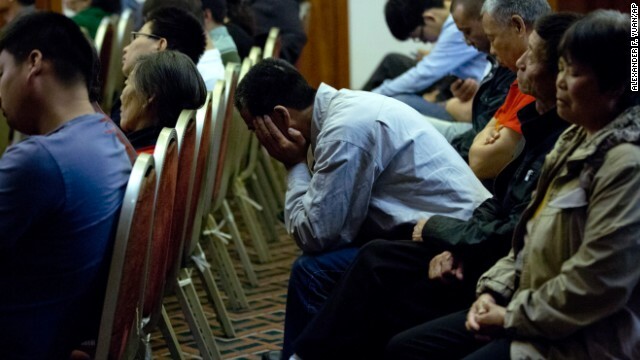 Angry relatives of those aboard Malaysia Airlines Flight 370 react in Beijing on Monday, March 24, after hearing that the plane went down over the southern Indian Ocean, according to analysis of satellite data. 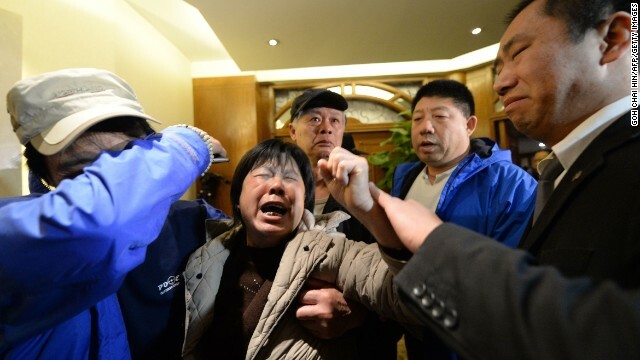 Grieving relatives of missing passengers leave a hotel in Beijing on March 24. 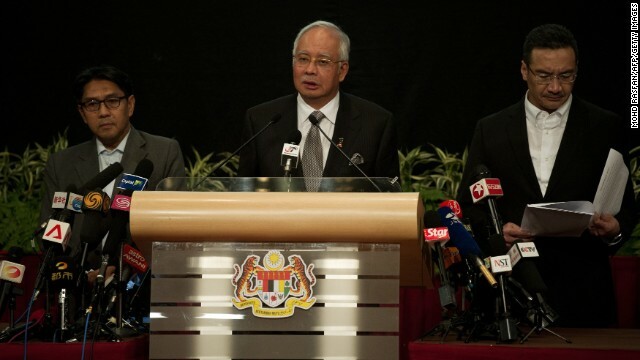 Malaysian Prime Minister Najib Razak, center, delivers a statement about the flight March 24 in Kuala Lumpur. 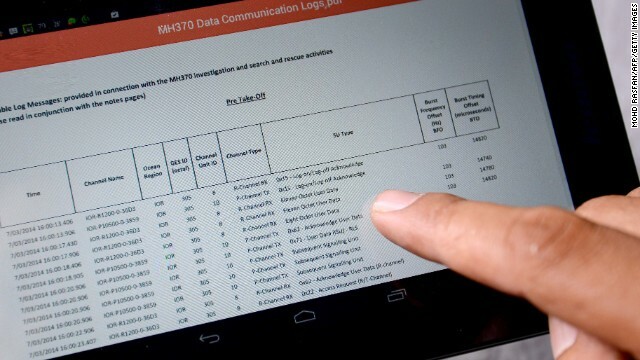 Razak's announcement came after the airline sent a text message to relatives saying it "deeply regrets that we have to assume beyond any reasonable doubt that MH 370 has been lost and that none of those onboard survived." 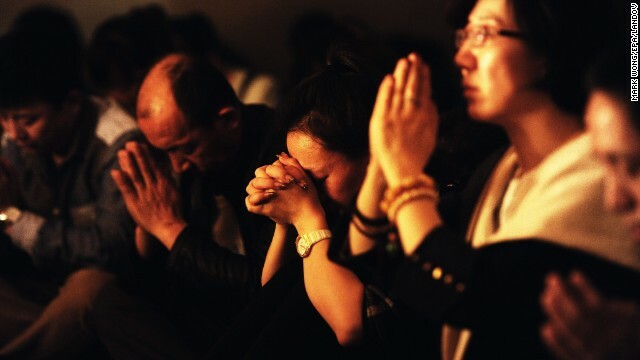 Relatives of the missing passengers hold a candlelight vigil in Beijing on March 24. 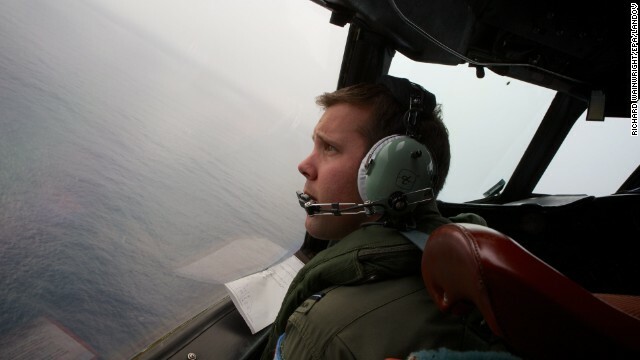 A member of the Royal Australian Air Force looks out an aircraft during a search for the missing jet March 24. 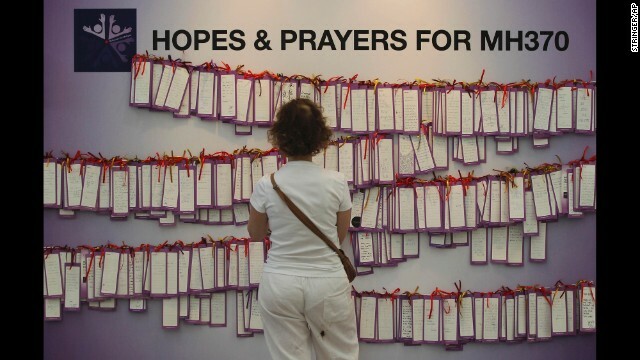 A woman reads messages for missing passengers at a shopping mall in Kuala Lumpur on March 24. 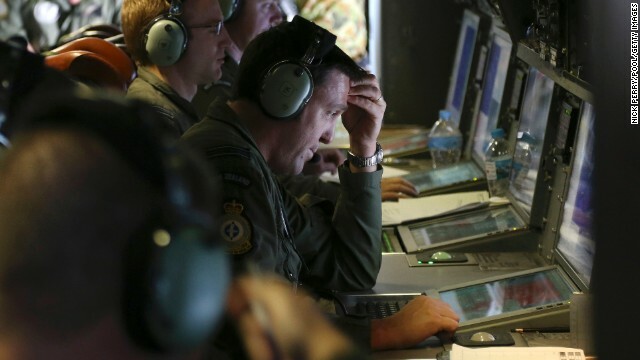 Flight Lt. Josh Williams of the Royal Australian Air Force operates the controls of an AP-3C Orion on Sunday, March 23, after searching the southern Indian Ocean. 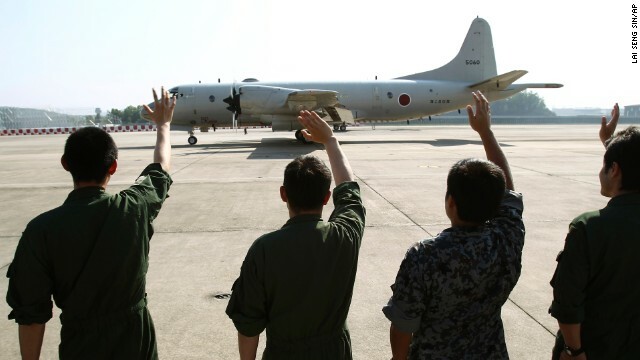 Ground crew members wave to a Japanese Maritime Defense Force patrol plane as it leaves the Royal Malaysian Air Force base in Subang, Malaysia, on Sunday, March 23. 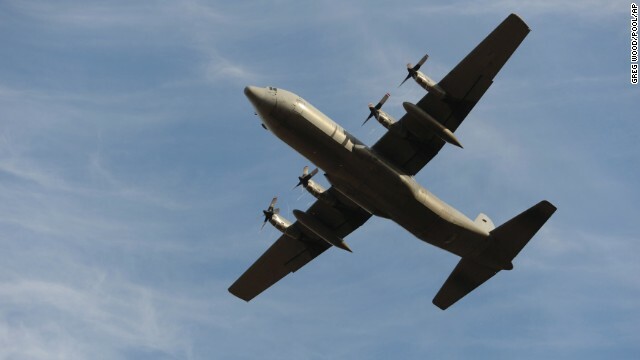 The plane was heading to Australia to join a search-and-rescue operation. A passenger views a weather map in the departures terminal of Kuala Lumpur International Airport on Saturday, March 22. 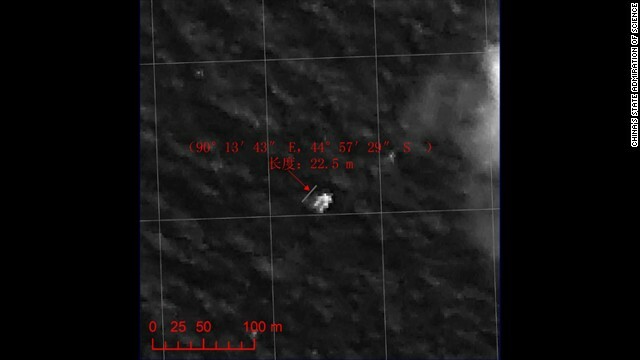 A Chinese satellite captured this image, released on March 22, of a floating object in the Indian Ocean, according to China's State Administration of Science. 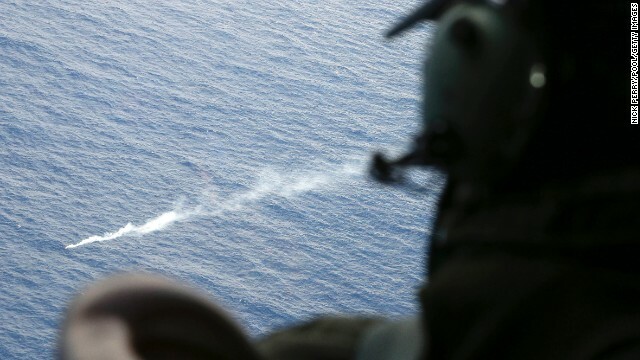 It is a possible lead in the search for the missing plane. 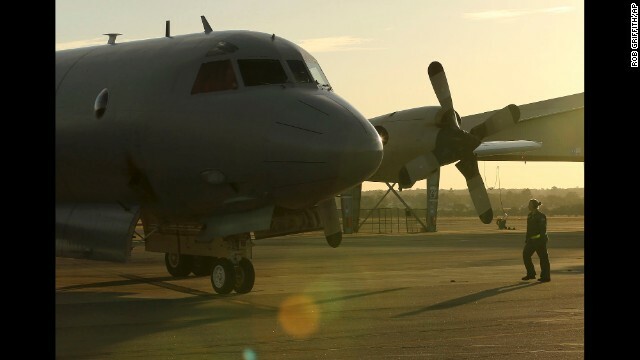 Surveillance planes are looking for two objects spotted by satellite imagery in remote, treacherous waters more than 1,400 miles from the west coast of Australia. 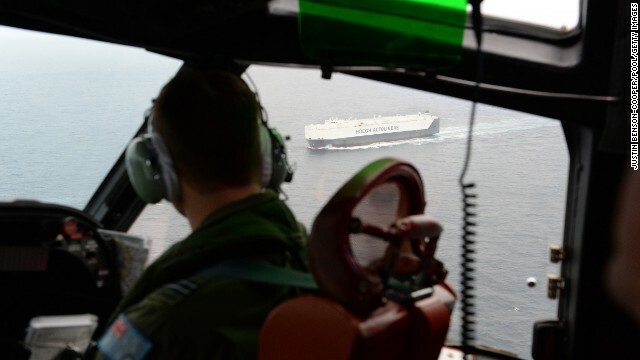 A member of the Royal Australian Air Force looks down at the Norwegian merchant ship Hoegh St. Petersburg, which took part in search operations Friday, March 21. 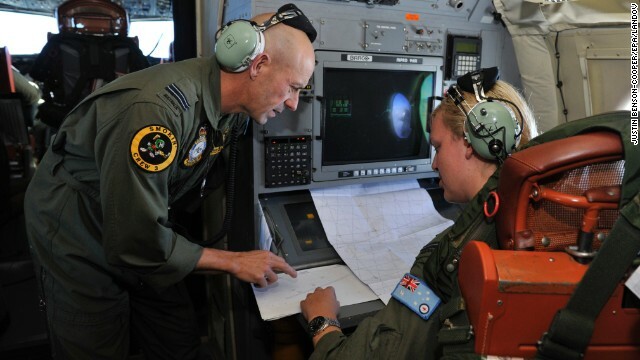 The Royal Australian Air Force's Neville Dawson, left, goes over the search area with Brittany Sharpe aboard an AP-3C Orion some 2,500 kilometers (about 1,500 miles) southwest of Perth, Australia, over the Indian Ocean on March 21. 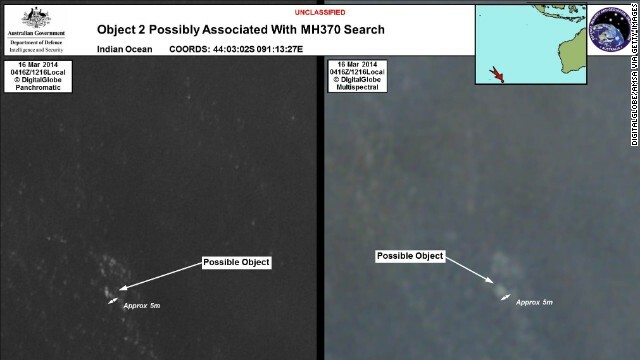 Satellite imagery provided by the Australian Maritime Safety Authority on Thursday, March 20, shows debris in the southern Indian Ocean that could be from Flight 370. The announcement by Australian officials that they had spotted something raised hopes of a breakthrough in the frustrating search. 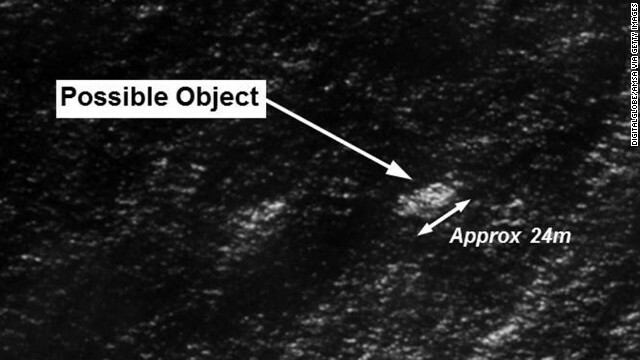 A closer look at the satellite shot of possible debris from Malaysia Airlines Flight 370. 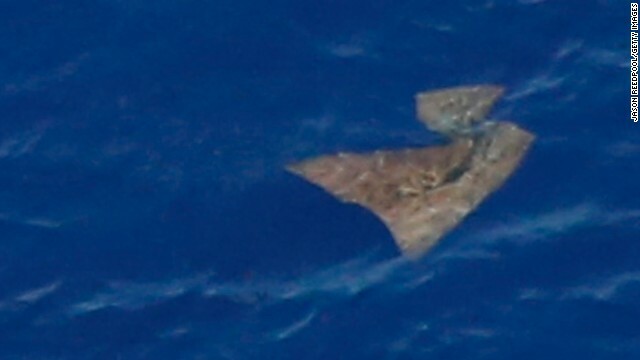 Another satellite shot provided by the Australian Maritime Safety Authority shows possible debris from the flight. 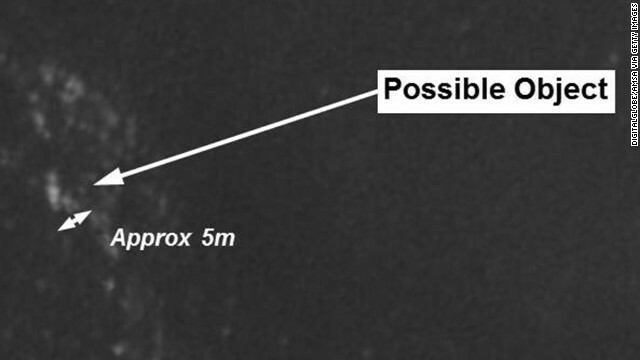 A closer look at the satellite shot of possible debris. The Australian Maritime Safety Authority's John Young speaks to the media in Canberra, Australia, on March 20 about satellite imagery. A distraught relative of a missing passenger breaks down while talking to reporters at Kuala Lumpur International Airport on Wednesday, March 19. 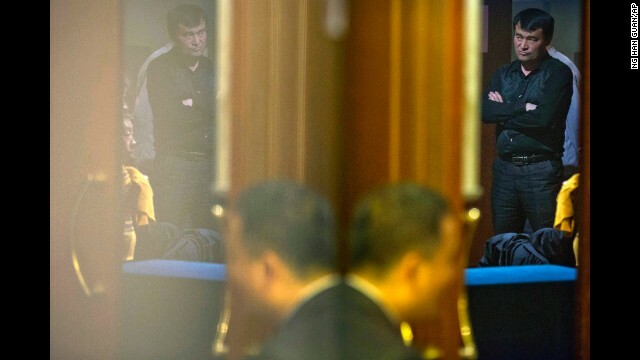 A relative of missing passengers waits for a news briefing by officials in Beijing on Tuesday, March 18. 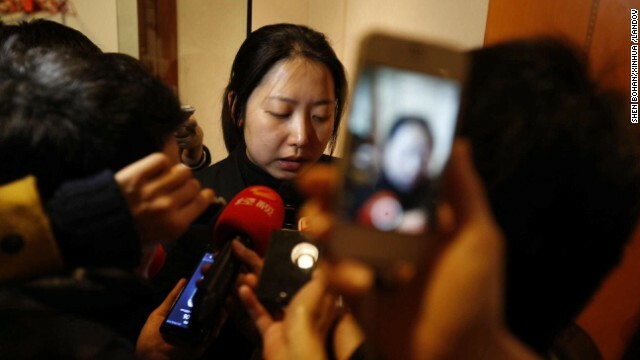 A relative of a missing passenger tells reporters in Beijing about a hunger strike to protest authorities' handling of information about the missing jet. 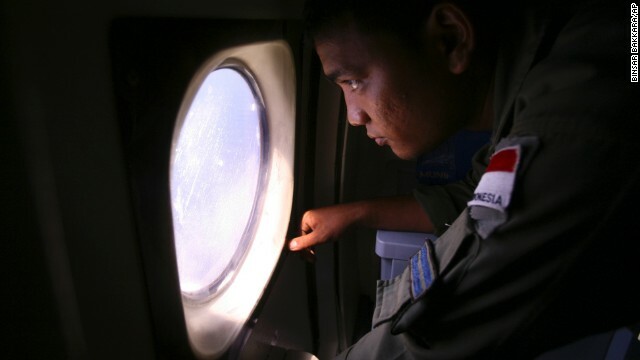 A member of Indonesia's National Search and Rescue Agency joins in a search for the missing plane in the Andaman Sea area around the northern tip of Indonesia's Sumatra on Monday, March 17. 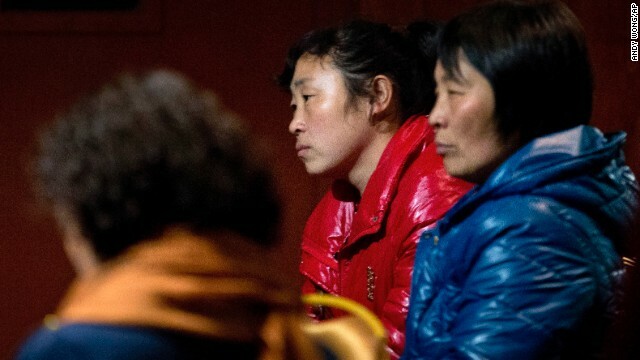 Relatives of missing passengers watch a news program about the missing plane as they await information at a hotel ballroom in Beijing on March 17. Malaysian Transportation Minister Hishamuddin Hussein, center, shows maps of the search area at a hotel next to the Kuala Lumpur International Airport on March 17. U.S. Navy crew members assist in search-and-rescue operations Sunday, March 16, in the Indian Ocean. 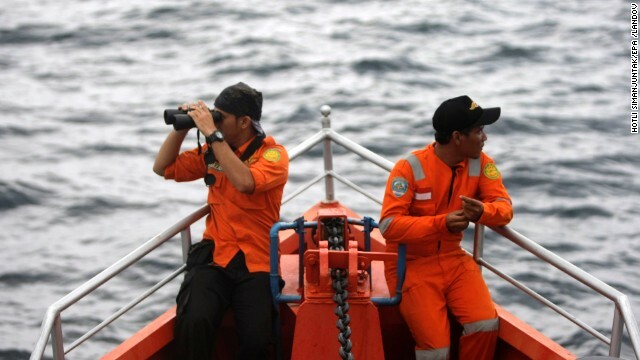 Indonesian personnel watch over high seas during a search operation in the Andaman Sea on Saturday, March 15. 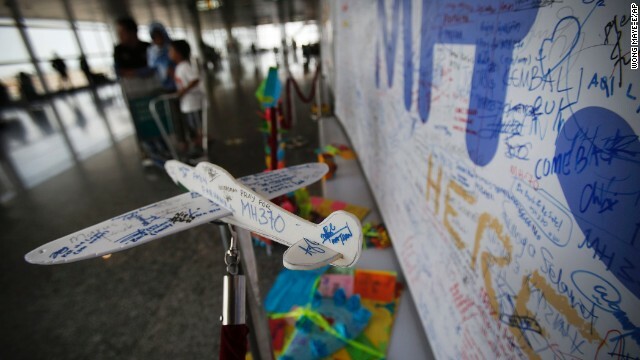 A foam plane, which has personalized messages for the missing flight's passengers, is seen at a viewing gallery March 15 at Kuala Lumpur International Airport. 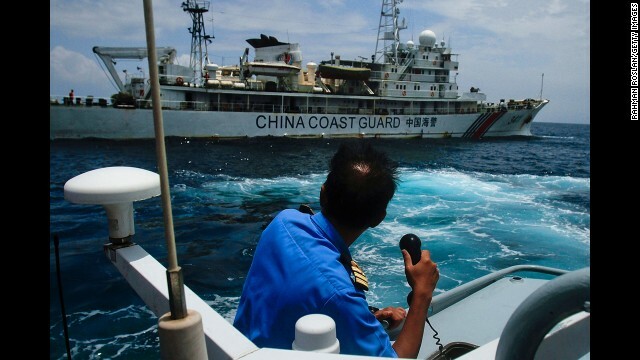 A member of the Malaysian navy makes a call as his ship approaches a Chinese coast guard ship in the South China Sea on March 15. A Indonesian ship heads to the Andaman Sea during a search operation near the tip of Sumatra, Indonesia, on March 15. Elementary school students pray for the missing passengers during class in Medan, Indonesia, on March 15. Col. 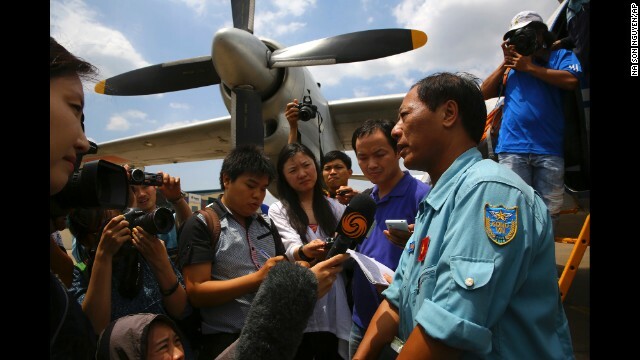 Vu Duc Long of the Vietnam air force fields reporters' questions at an air base in Ho Chi Minh City, Vietnam, after a search operation on Friday, March 14. 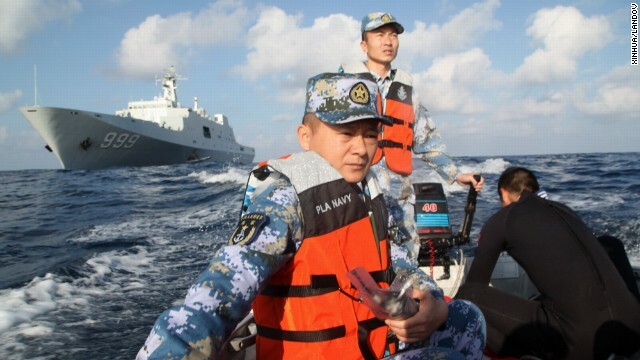 Members of the Chinese navy continue search operations on Thursday, March 13. 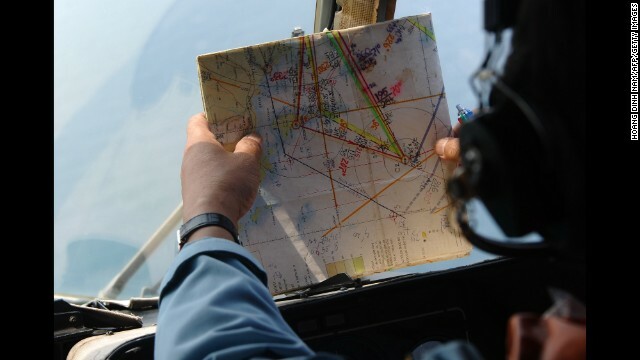 The search area for Flight 370 has grown wider. After starting in the sea between Malaysia and Vietnam, the plane's last confirmed location, efforts are expanding west into the Indian Ocean. 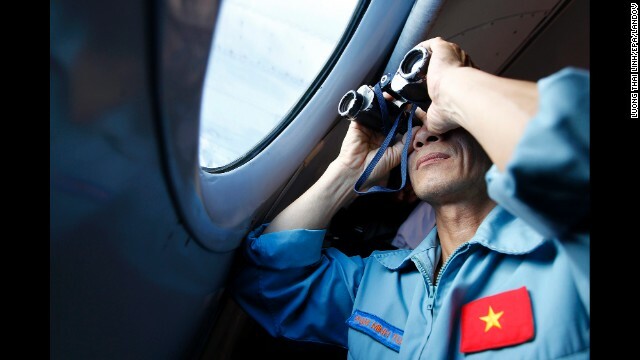 A Vietnamese military official looks out an aircraft window during search operations March 13. Malaysian air force members look for debris on March 13 near Kuala Lumpur. A relative of a missing passenger watches TV at a Beijing hotel as she waits for the latest news March 13. 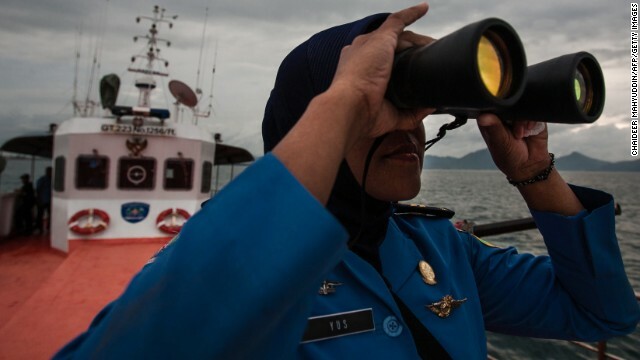 A member of the Indonesian National Search and Rescue Agency scans the horizon in the Strait of Malacca on Wednesday, March 12. 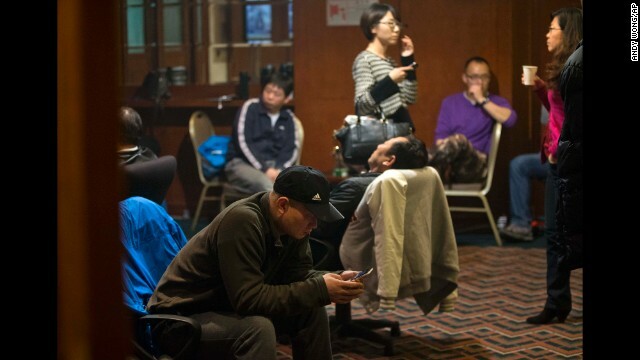 Relatives of missing passengers wait for the latest news at a hotel in Beijing on March 12. Journalists raise their hands to ask questions during a news conference in Sepang on March 12. 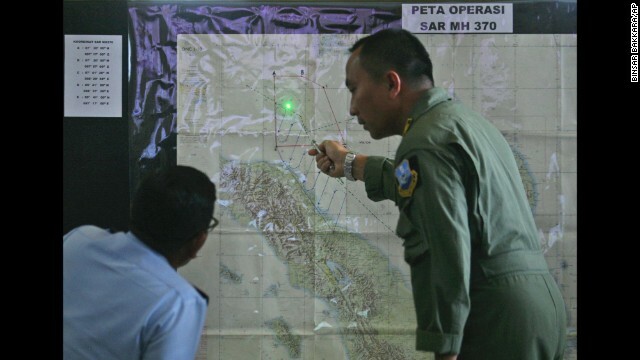 Indonesian air force officers in Medan, Indonesia, examine a map of the Strait of Malacca on March 12. A member of the Vietnamese air force checks a map while searching for the missing plane on Tuesday, March 11. 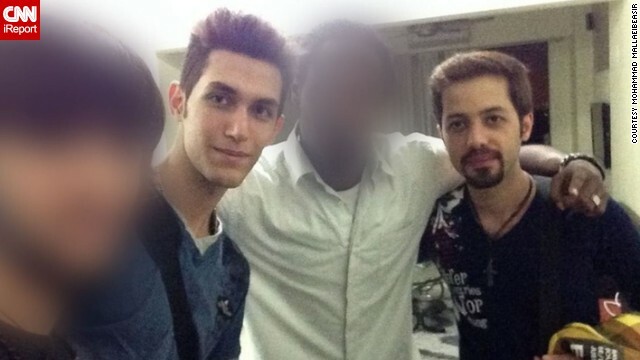 Iranians Pouri Nourmohammadi, second left, and Delavar Seyed Mohammad Reza, far right, were identified by Interpol as the two men who used stolen passports to board the flight. But there's no evidence to suggest either was connected to any terrorist organizations, according to Malaysian investigators. Malaysian police believe Nourmohammadi was trying to emigrate to Germany using the stolen Austrian passport. 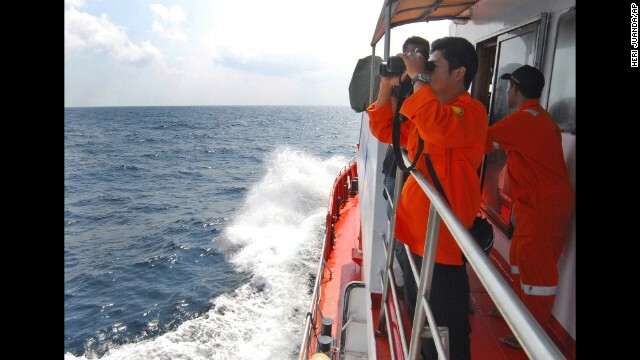 An Indonesian navy crew member scans an area of the South China Sea bordering Indonesia, Malaysia and Thailand on Monday, March 10. Vietnam air force Col. 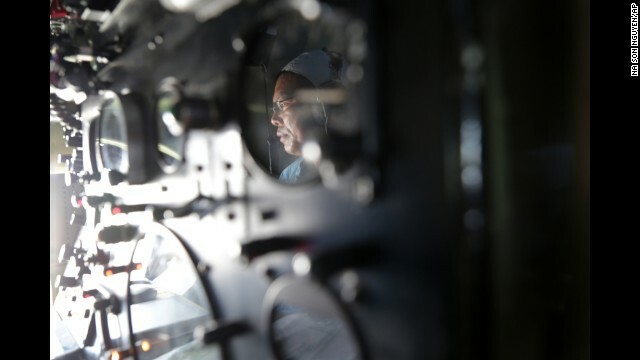 Le Huu Hanh is reflected on the navigation control panel of a plane that is part of the search operation over the South China Sea on March 10. Relatives of the missing flight's passengers wait in a Beijing hotel room on March 10. 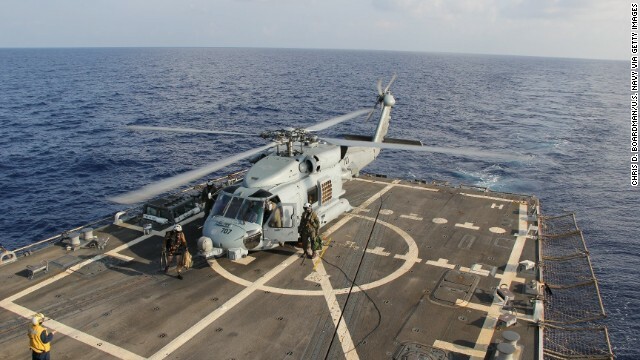 A U.S. Navy Seahawk helicopter lands aboard the USS Pinckney to change crews before returning to search for the missing plane Sunday, March 9, in the Gulf of Thailand. Members of the Fo Guang Shan rescue team offer a special prayer March 9 at Kuala Lumpur International Airport. 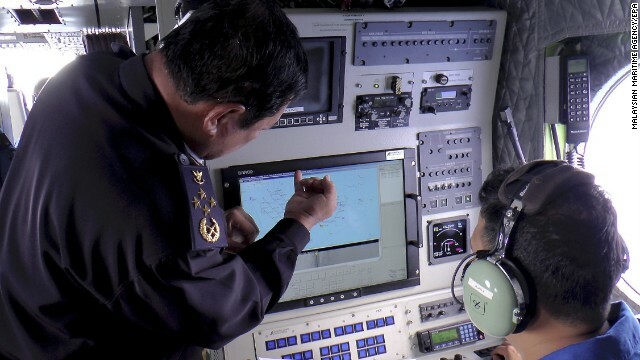 A handout picture provided by the Malaysian Maritime Enforcement Agency shows personnel checking a radar screen during search-and-rescue operations March 9. 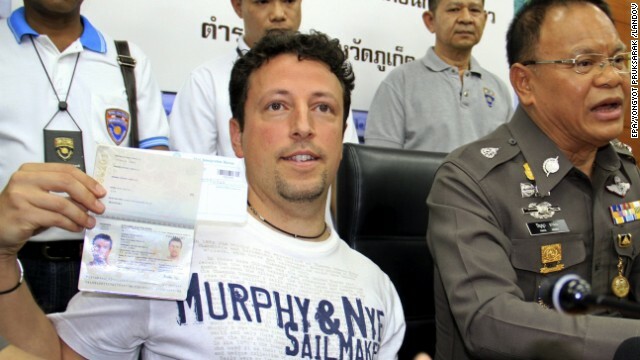 Italian tourist Luigi Maraldi, who reported his passport stolen in August, shows his current passport during a news conference at a police station in Phuket island, Thailand, on March 9. Two passengers on the missing Malaysia Airlines flight were reportedly traveling on stolen passports belonging to Maraldi and an Austrian citizen whose papers were stolen two years ago. Hugh Dunleavy, commercial director of Malaysia Airlines, speaks to journalists March 9 at a Beijing hotel where relatives and friends of the missing flight's passengers are staying. 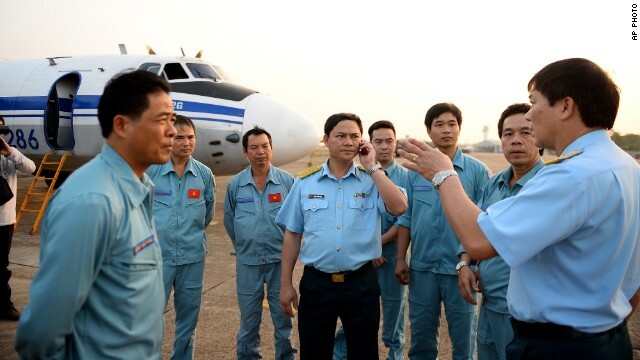 Vietnamese air force crew stand in front of a plane at Tan Son Nhat airport in Ho Chi Minh City on March 9 before heading out to the area between Vietnam and Malaysia where the airliner vanished. 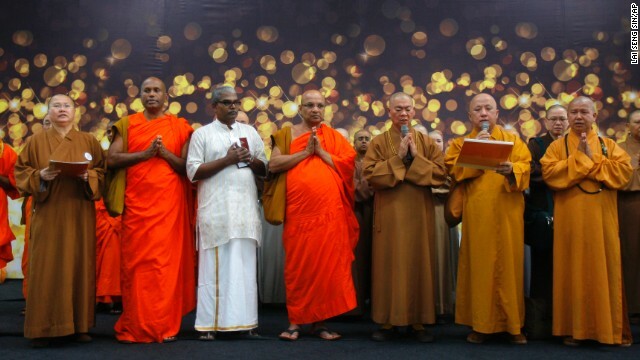 Buddhist monks at Kuala Lumpur International Airport offer a special prayer for the missing passengers on March 9. 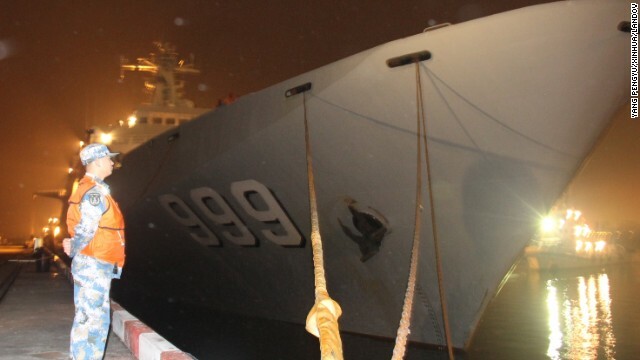 The Chinese navy warship Jinggangshan prepares to leave Zhanjiang Port early on March 9 to assist in search-and-rescue operations for the missing Malaysia Airlines flight. The Jinggangshan, an amphibious landing ship, is loaded with lifesaving equipment, underwater detection devices and supplies of oil, water and food. Members of a Chinese emergency response team board a rescue vessel at the port of Sanya in China's Hainan province on March 9. 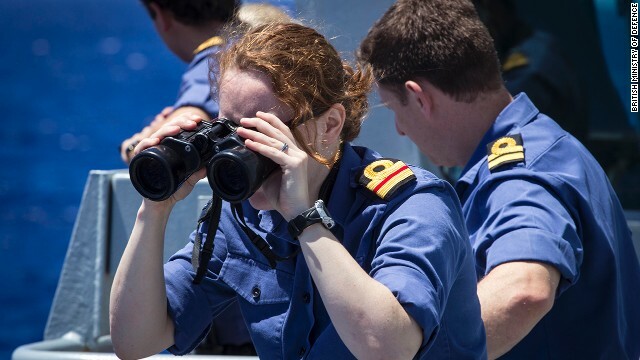 The vessel is carrying 12 divers and will rendezvous with another rescue vessel on its way to the area where contact was lost with Malaysia Airlines Flight 370. 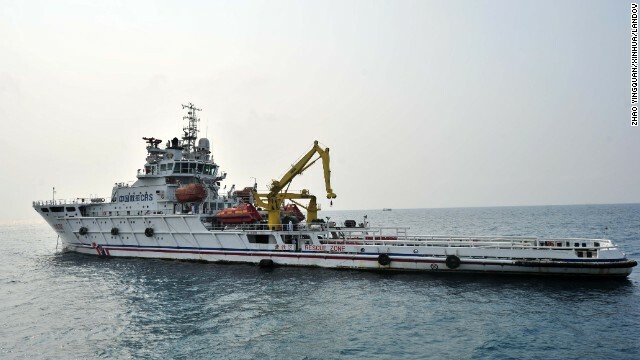 The rescue vessel sets out from Sanya in the South China Sea. 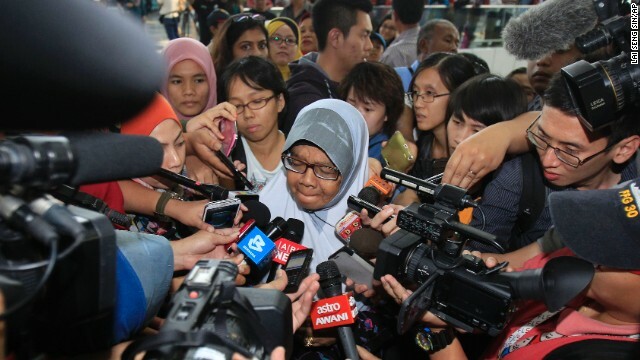 A family member of missing passengers is mobbed by journalists at Kuala Lumpur International Airport on Saturday, March 8. 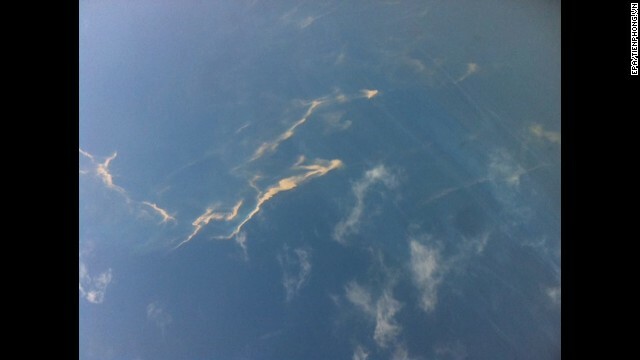 A Vietnamese air force plane found traces of oil that authorities had suspected to be from the missing Malaysia Airlines plane, the Vietnamese government online newspaper reported March 8. However, a sample from the slick showed it was bunker oil, typically used to power large cargo ships, Malaysia's state news agency, Bernama, reported on March 10. 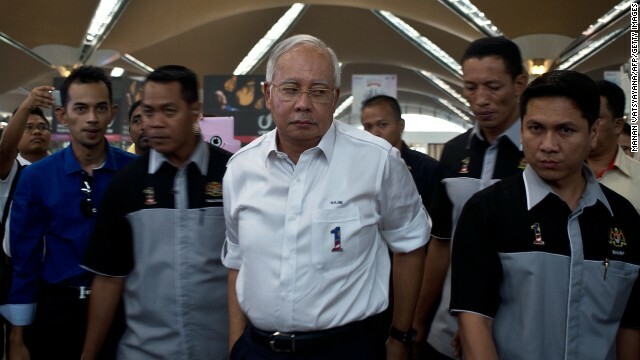 Malaysian Prime Minister Najib Razak, center, arrives to meet family members of missing passengers at the reception center at Kuala Lumpur International Airport on March 8. 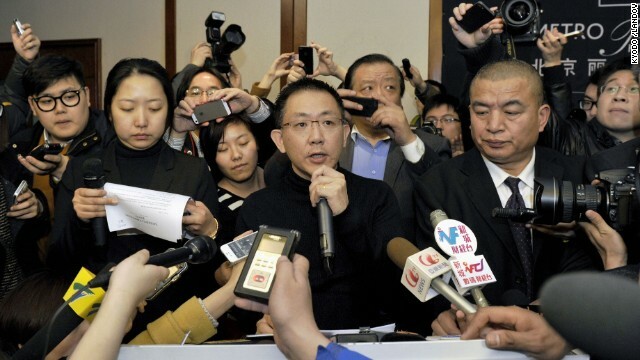 Malaysia Airlines official Joshua Law Kok Hwa, center, speaks to reporters in Beijing on March 8. 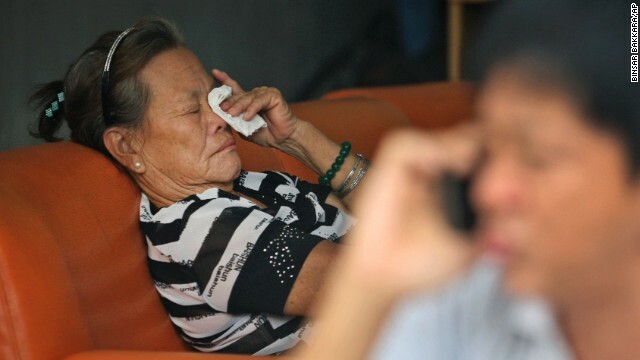 A relative of two missing passengers reacts at their home in Kuala Lumpur on March 8. Wang Yue, director of marketing of Malaysia Airlines in China, reads a company statement during a news conference at the Metro Park Lido Hotel in Beijing on March 8. 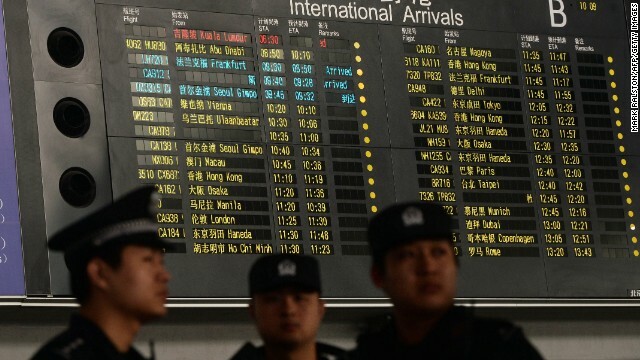 Chinese police at the Beijing airport stand beside the arrival board showing delayed Flight 370 in red on March 8. 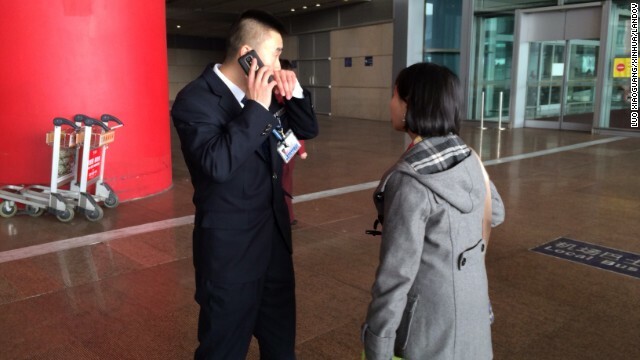 A woman asks a staff member at the Beijing airport for more information on the missing flight. 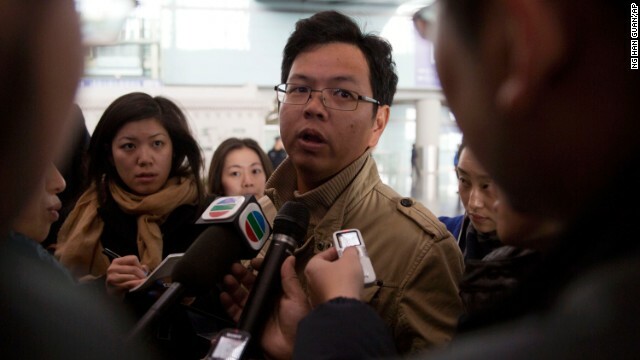 A Malaysian man who says he has relatives on board the missing plane talks to journalists at the Beijing airport on March 8. 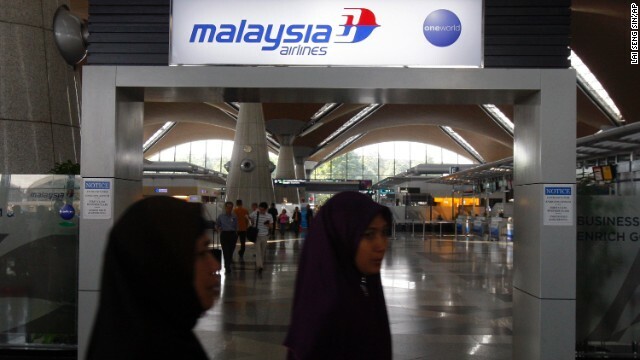 Passengers walk past a Malaysia Airlines sign on March 8 at Kuala Lumpur International Airport. Malaysia Airlines Group CEO Ahmad Juahari Yahya, front, speaks during a news conference on March 8 at a hotel in Sepang. "We deeply regret that we have lost all contacts" with the jet, he said. 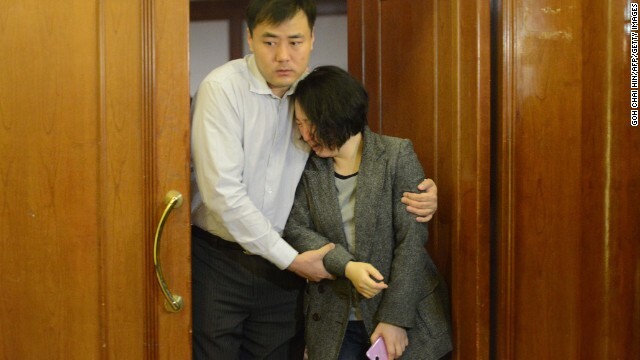 On Saturday, a young woman from the nearby port city of Tianjin broke down in tears as she told CNN that her boyfriend was on board the flight. They had plans to marry, she said. Another woman wailed for her missing son as she was led inside. "My son was only 40 years old," she cried. "My son, my son. What am I going to do?" A man who identified himself as a friend of passenger Yang Jiabao showed reporters the missing man's driver's license in the hope it might help authorities find the man. Acting Malaysian Transportation Minister Hishammuddin Hussein said he met with families in Malaysia on Sunday. "It has been another long day. Thank you all for your thoughtful prayers. Hope will get us through the days ahead," he tweeted. Late Saturday evening, family members met with a Malaysia Airlines delegation that had been dispatched to the Chinese capital to provide support and information. At a news conference in the early hours of Sunday, Ignatius Ong, CEO of Malaysia Airlines subsidiary Firefly and spokesman for the airline's management group, announced that immediate families should head to Kuala Lumpur. The airline would cover their travel expenses and would fly the relatives to the plane's location "once the whereabouts of the aircraft is determined," he said. Chinese media reported Sunday that the airline announced it would help next of kin get passports if needed and was planning to fly the first group to Kuala Lumpur on Tuesday. With at least 12 nationalities on board, Flight 370's disappearance left families around the world reeling. Besides the Chinese passengers -- who, according to Chinese state media, included a delegation of painters and calligraphers returning from an exhibition and a group of Buddhists returning from a religious gathering -- the flight carried passengers from Malaysia, India, Indonesia, Australia, the United States, France, New Zealand, Ukraine, Canada, Russia and the Netherlands. The Canadians have been identified as Muktesh Mukherjee, 42, vice president of China operations for Xcoal Energy & Resources, and his wife Bai Xiaomo, 37. The couple, who once lived in Montreal, lived in Beijing with their two young boys, the Canadian broadcaster CTV reported Sunday. Painful "Comms: As a father myself, I understand what this man is going through as his son is on #MH370. pic.twitter.com/YA9ZIC5aJ0"
The airline's manifest showed the passengers hailed from 14 countries, but later it was learned that two people named on the manifest -- an Austrian and an Italian whose passports had been stolen -- were not aboard the plane. The plane was carrying five children younger than 5 years old, the airline said. 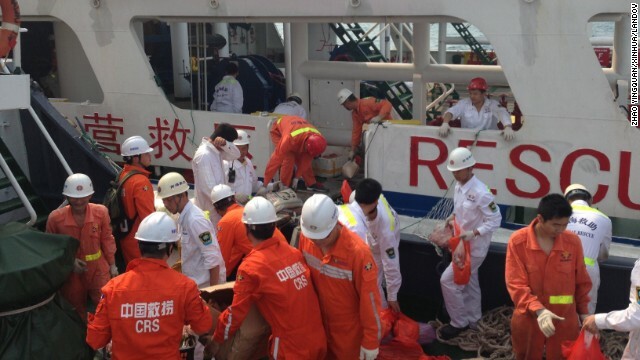 Mei Ling Chng is believed to have been one of the people onboard. A Malaysian national who has been living in Pennsylvania since 2010, she worked as a process engineer, according to Tracy Kilgore, spokeswoman at Eastman Chemical Company, where Chng works. "As you can imagine this has been a very shocking and sad situation, and our thoughts and prayers go out to the families of all aboard the missing flight and in particular to those of our co-worker," the spokeswoman said. The family of Philip Wood, one of three Americans identified as among the missing, issued a statement describing him as "a man of God, a man of honor and integrity. His word was gold." "Incredibly generous, creative and intelligent, Phil cared about people, his family, and above all, Christ," the family said. "Though our hearts are hurting, we know so many families around the world are affected just as much as us by this terrible tragedy." 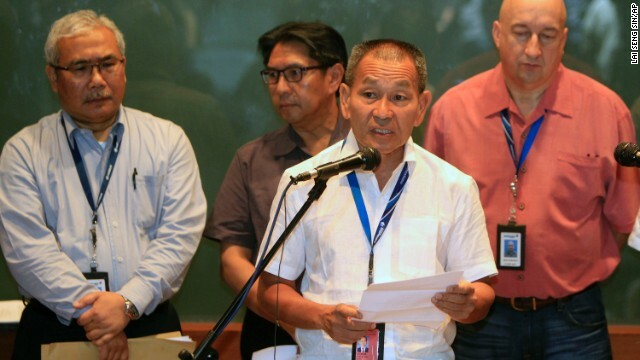 Texas-based firm Freescale Semiconductor confirmed that 20 employees were passengers on Flight 370. Twelve are from Malaysia and eight from China, the company said Saturday. "At present, we are solely focused on our employees and their families," Freescale's president and CEO Gregg Lowe said in the statement. "Our thoughts and prayers are with those affected by this tragic event." Later, the company tweeted: "Your thoughtful words and prayers for Freescale families and friends affected by MH370 give comfort." The company was making counselors available with around-the-clock support for employees affected by the tragedy, the statement said. CNN's AnneClaire Stapleton, Serena Dong, Yuli Yang and Dayu Zhang in Beijing contributed to this report. 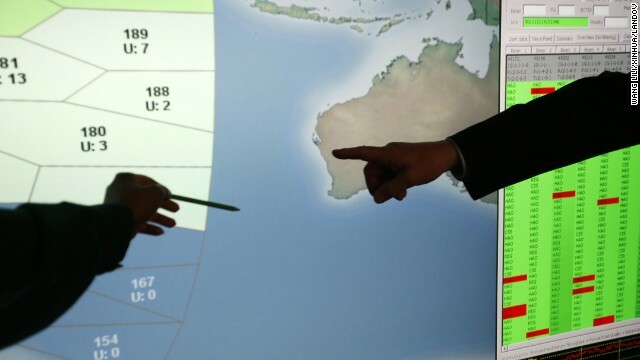 The search for MH370 is moving to an area farther south in the Indian Ocean, said the Australian Deputy Prime Minister. Erin Burnett speaks to Miles O'Brien about the latest in the search for Malaysia Airlines Flight 370. Was search hundreds of miles off? 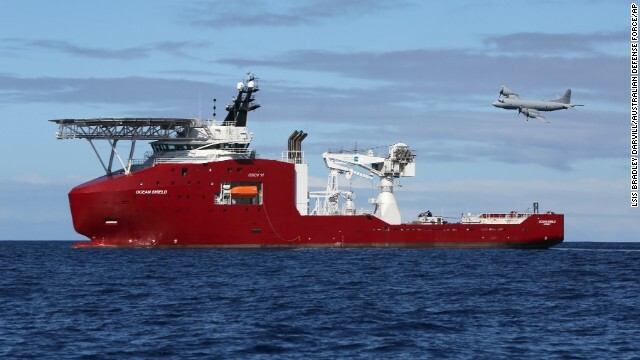 Ten experts say that the search for MH370 should move hundreds of miles away from the previous search area. His wife never came home from her flight on MH370, and now K.S. Narendran is left to imagine the worst of possible truths without knowing. 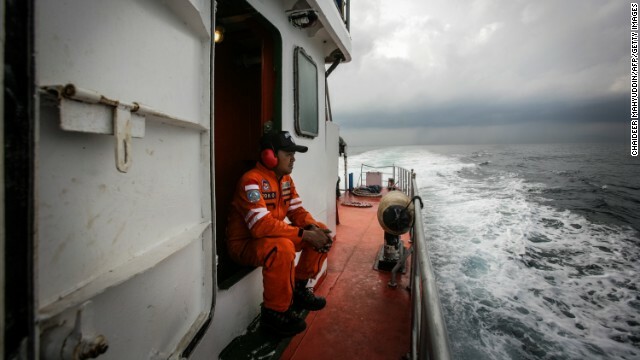 Families are desperate for results as the search for MH370 reaches a grim milestone. Anna Coren reports from Beijing. Relatives of passengers are launching an effort to raise $5 million for investigations and a "whistle blower" reward. Making sure another plane is never "lost" again is the immediate priority for the airline industry. Is this the sound of the crash? Was the sound of Malaysian Airlines Flight MH370 striking the water captured by ocean devices used to listen for signs of nuclear blasts? 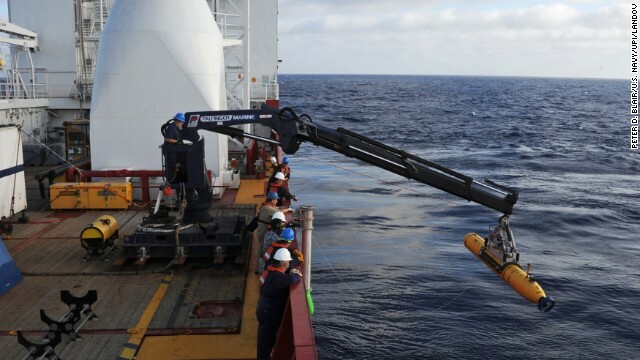 What was believed to be the best hope of finding the missing plane is now being called a false hope. Rene Marsh explains. Involved parties, including the manufacturer Boeing, are bracing for a long public relations siege. 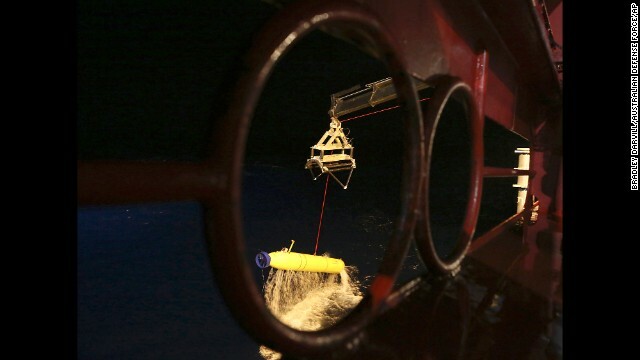 Official: The four acoustic pings at the center of the search for Flight 370 are no longer believed to have come from the plane's black boxes. There is one fundamental question which continues to swirl: Has Inmarsat got its numbers right? Family members of the people aboard missing plane want independent investigators to review the newly released satellite data. What will the Inmarsat data reveal? CNN's Richard Quest explains what kind of information should be contained in the Inmarsat data from Flight MH370. 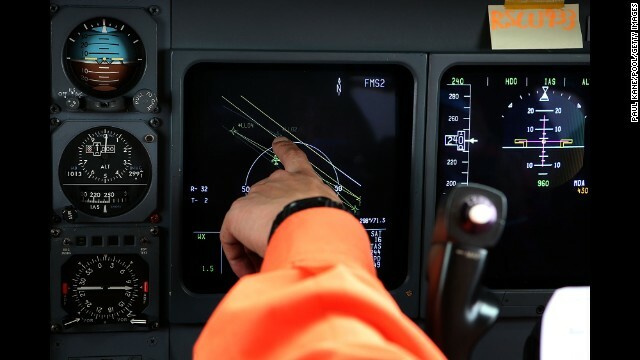 The underwater search for the missing Malaysia Airlines plane will effectively be put on hold this week, and may not resume until August at the earliest. 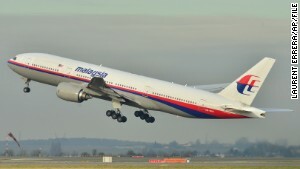 Movie-makers in Cannes have announced they're making a thriller based on the disappearance of Malaysian flight MH370. 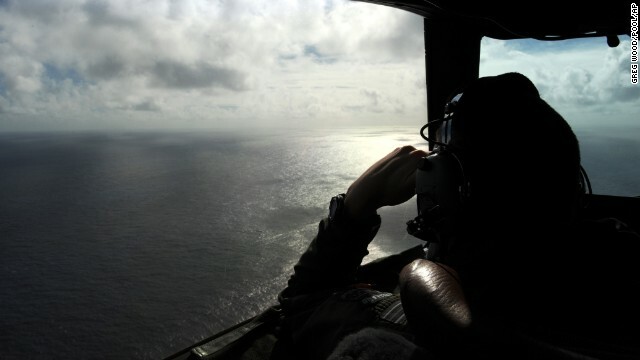 The search for the missing Boeing 777 has gone on for eight weeks now. CNN's David Molko looks back at this difficult, emotional assignment.